I was recently at a friend's newly refurbished home, and the one thing that stood out for me was the beautiful backsplash (or splashback) she has used in her kitchen. I have been pondering over a new kitchen for a while now, and a trendy backsplash is something I would love to incorporate in my vision. 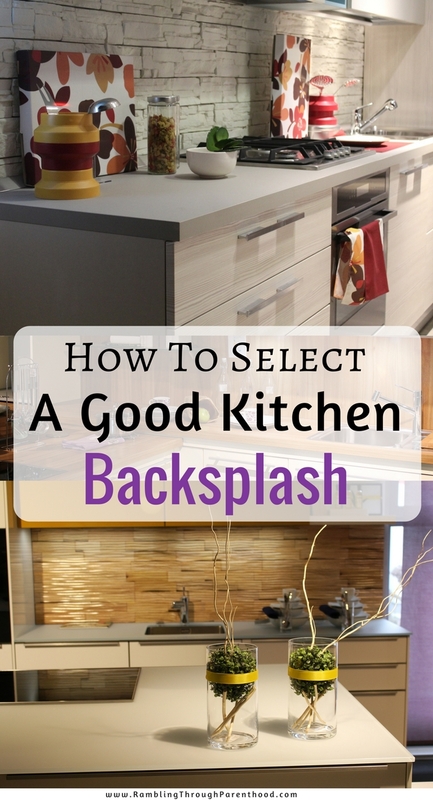 Kitchen backsplashes are not just pretty, they have another very important benefit – keeping food off of your walls! This was their original intended purpose, but over the years they have developed into more of a design statement. Backsplashes come in all sorts of options. Here, I give you the more commonly used and popular ones. Glass comes in three main formats. You have glass plates, which tend to be very large whole pieces of glass. You might need 1-10 plates depending on the size of the backsplash, that is if you intend to do just one space behind the faucet, or the entire kitchen. Then you have square glass tiles. These can be used, again, in one small spot behind the counter, behind the sink or behind the stove – or all over. The last format are longish tiles, about 3-6 inches long. These allow you to use varying tones in a colour to create a more tonal backsplash. My friend has used glass all over in her kitchen. So she now has an easy to clean backsplash and kitchen surfaces. Ceramic tiles have been used for years as backsplashes and they are the more common option. You can find individual tiles as well as sheets. The sheets are a lot easier to install. Ceramic is not as strong as porcelain, though, so they can sometimes chip or crack. Porcelain is cooked at a much higher temperature than its cousin, ceramic, which makes it an ideal option for a backsplash. It might not seem like it's important to have a durable material behind the sink, but it is! Porcelain comes in an array of styles, colours, shapes and patterns, so you will always find something to suit your style and budget. These are really pretty, but because of the weight and the material, they can be expensive. Stone would include things like granite, marble and limestone as well as quartz. You might not automatically think about stone as a backsplash, more as a counter top or a floor. But stone does look really amazing, luxurious and stylish, as a backsplash. Wood tiles and planks add a certain old-world charm to a kitchen. They bring warmth and style. Wood tiles come in various sizes with the smallest being 1x1 inches, but they also come in planks as well. The choice depends on what look you are going for. Wood backsplashes can save you a pretty penny if you look at upcycling things like wooden crates and boxes. Sand them down, add a stain, a coating and then use a guide to adhere the wood to the wall for the backsplash. Now there's a fun DIY project for this summer! Metal tiles are a trendy option if you are going for a more retro look. While copper is an obvious choice, metal tiles also come in other materials as well that aren’t completely retro like stainless steel, bronze and brushed aluminium. When considering kitchen backsplashes, think about your style, budget and installation options. Work with materials that fit best with your needs. Chose something you love, and it will be a thing of joy and beauty in your kitchen for years to come.